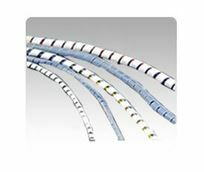 Robust, yet simple to install, it gives mechanical protection to the wire bundle which remains flexible although rigidly held. Easily removed, it can be re-used in the case of temporary. Spiral Wraps are available in White & Natural Color. Black also available in 100 feet rolls only.